Carolyn Casey-Figueroa knew she was on to something when she was invited to view a vast collection of artifacts belonging to muralist Leo Tanguma. She found herself in an archival heaven— sketches, slides, photographs and other artifacts spanning floor to ceiling that told the story of Tanguma’s journey as a Chicano muralist that began in the early 1950s. The archive had never been made available to the public— Casey-Figueroa and her husband were viewing it in the basement studio of Tanguma’s Denver home. Muralist Leo Tanguma in the basement of his Denver, Colo. home. 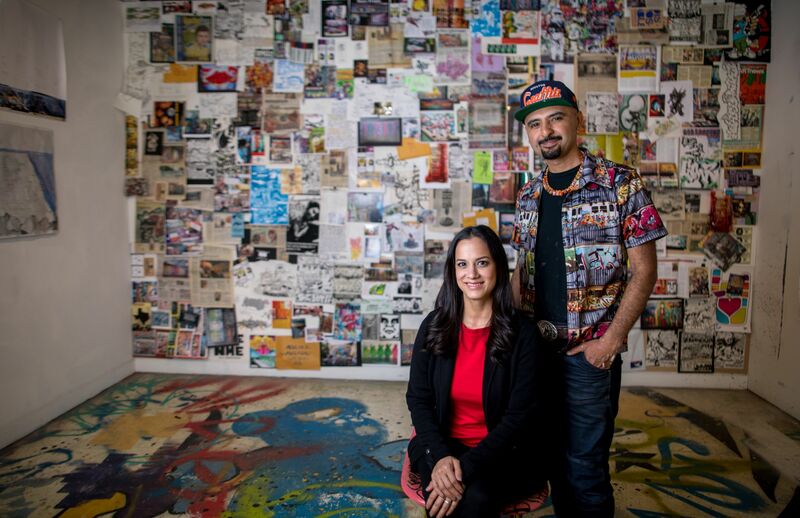 The experience was a lasting one for Casey-Figueroa, a graduate of the University of Houston Master of Arts in Arts Leadership program, but it was especially meaningful for her husband, Houston graffiti artist Mario E. Figueroa Jr., artistically named GONZO247. 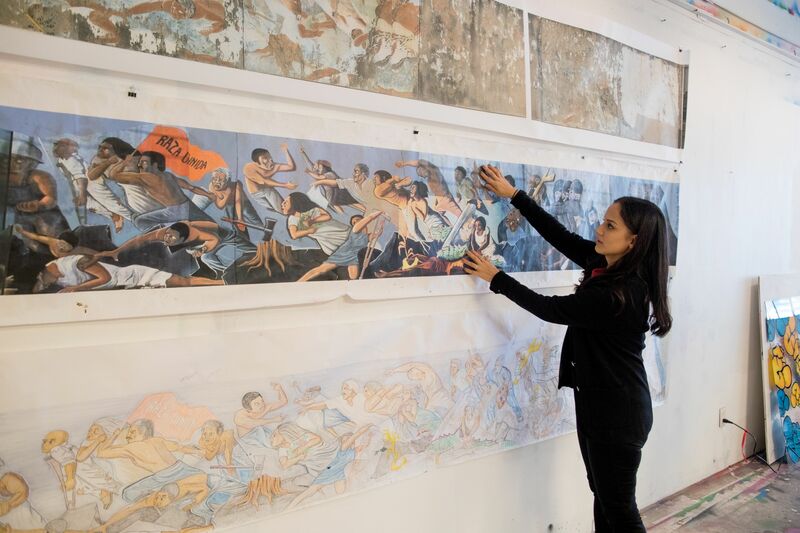 As a young artist growing up in Houston’s Second Ward, Figueroa was awe-struck by Tanguma’s iconic 1973 mural "The Rebirth of Our Nationality," a 240-by-18-foot mural painted on the side of a factory at 5900 Canal St. It featured scenes of oppression and injustice, which chronicles the trials and tribulations of the Chicano movement in Houston during that time. Figueroa was too young to understand the meaning of the mural but it spoke to him in a profound way. Tanguma&apos;s East End masterpiece, "The Rebirth of Our Nationality," was recreated in 2018. "I was born in 1972 in the (East End) neighborhood. Growing up, that was the only access I had to public art. I didn’t have access to formal art institutions," said Gonzo, founder of Aerosol Warfare Studios and The Graffiti and Street Art Museum of Texas. "When we drove to see family, I would see this wall almost every day. The scale of it left an impression on me— not understanding how it was humanly possible to do something like that, but knowing it would be awesome to do something like that one day. That started my journey with the idea of wanting to be an artist." "That started my journey with the idea of wanting to be an artist." Today, GONZO247&apos;s works can be seen within just a few miles of the mural that inspired him as a child. And in return, his aerosol art has inspired Houston. That day in the basement, Casey-Figueroa couldn&apos;t help but see a parallel between Tanguma and Gonzo. “They were telling this story of their different art forms and the way they were juxtaposed, but also the way their cultures would mirror each other at times and how the two shared similarities in some aspects of their lives,” Casey-Figueroa recalls of a conversation between the two. Artists GONZO247 and Leo Tanguma met for the first time in 2015. That meeting in Denver in 2015 was the first time Gonzo and Tanguma had met in person. Harris County had bought the building on Canal St. that featured the iconic mural and officials reached out to Tanguma, hoping he would consider repainting his masterpiece— art conservators said the original work could not be restored. He declined the offer but gave his blessing for Gonzo to recreate it. It was the accumulation of photos and documents that Tanguma had kept for all of those years in his basement that guided Gonzo and team to bring "The Rebirth of Our Nationality" back to life. "Culture is preserved through these archives." Gonzo completed the mural in September 2018 and the experience inspired Casey-Figueroa to start a public discussion about the importance of archiving an artist’s legacy. She will host a panel discussion on this issue at the Latino Art Now! (LAN!) Houston conference. “Artefacto: Preserving an Artist Legacy” is Saturday, April 6, 2019, from 9-10:30 a.m. at the University of Houston Student Center South, second floor, Downtown Room. 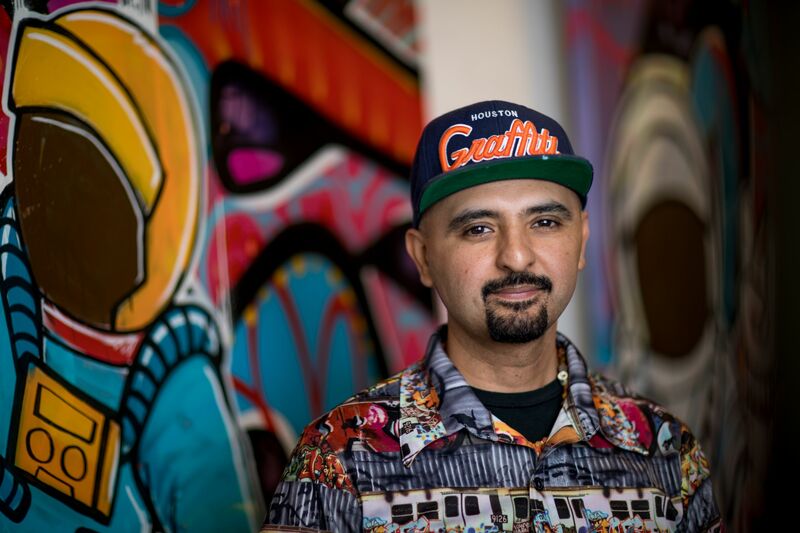 The talk will highlight the collaboration between Gonzo and Tanguma to recreate one of the largest murals of the Chicano movement. The topic is of particular interest to Gonzo, who has amassed his own collection of archival video, photography, documents, handwritten letters and audio clips that reveal his personal and professional story dating back to the late 1980s. “This type of collecting and documentation should be emphasized as an important aspect to any art practice to chronicle Latino art history over time and preserve their work in the community." GONZO247 has been archiving his work as well as hip-hop culture and graffiti art since the 1980s. Gonzo and Tanguma will be joined by Nancy Agin Dunnahoe, a UH graduate and founder of Neon Artifact; and Orlando Lara, artist and scholar at Texas Christian University. The conversation will address the process for documentation, importance of it and how it can help develop artists. The expert panel will also offer advice on how to best organize, store, catalogue and use archival materials. “This type of collecting and documentation should be emphasized as an important aspect to any art practice to chronicle Latino art history over time and preserve their work in the community,” Casey-Figueroa said. LAN! Houston is recognized as one of the nation’s leading forums for visual artists, art historians, curators, collectors and educators. Houston is the fifth major city to host the conference since it started in 2005. Click here to read about the history of the LAN! Conference. A communication by the University of Houston Division of University Marketing, Communication and Media Relations. Do you have a story idea you&apos;d like to share with UH? Email us at stories@uh.edu. We regret that we cannot respond to every submission. If your submission is a good fit, we will follow up with you directly.